Cheap Thrills (2013) is an indie horror film that has been garnering a fair amount of hype recently. Featuring David Koechner, aka Champ Kind on the cast and a simple, relatable, yet able to be taken to the extreme premise, it is easy to see why plenty have fallen in love with this film. Craig is a man down on his luck. His morning root was interrupted by his crying baby, a final notice has been pinned to his front door and to top it all off, he gets fired. This basic, effective, characterisation is filled out as the film progresses. We learn that the now fired mechanic was once a writer, who has clearly either fallen out of love with his art or lost the ability to produce. This back story is obviously not the point of a film like this, but it does definitely help to elevate the narrative and that level of detail and craft makes you (well me at least) a little more willing to overlook some of the film’s later flaws. Down on his luck, Craig finds himself in a dingy bar, trying to drink away the pain of losing his job, before heading home to see his wife and baby, who he now has absolutely no way of supporting. At the bar he runs across an old mate Vince, and they are in turn befriended by a rich couple played by Sara Paxton and David Koechner. These two are out for her birthday and Colin, played by Koechner, has an obsession with making memories which leads to the two old friends being challenged to a serious of dares with increasing financial stakes and correspondingly increasing levels of risked attached to them. I won’t give too much away, but the gauntlet kind of runs from taking shots to public toileting to severing limbs, with more than a few diversions into other stunts, which can be anywhere from unoriginally crude to intriguingly psychological. I am really not sure how I feel about the ending of Cheap Thrills. I for one did not see it coming, though I think I have heard others peg it as a little obvious. At first I was really not a fan. But now after letting it stew a little bit, even though I still don’t love it, I kind of respect it as a choice of ending. I definitely feel that, even though it is briefly touched upon, the financial aspect to the motivations of these characters really should have been fleshed out a little more. The film is clearly a comment on the haves and have nots in our societies. But the idea is just plonked there a little and I wanted some interrogation of it. Having said that though, it is great that a horror film even puts the ideas out there though, plenty of films would have focused totally on the crassness and the one upmanship. Morally, it was good that the character of Craig was at least a little conflicted to begin with and again this should have played out a little more through the economic exploration that the film was lacking. Ditto the almost immediate breakdown between Craig and Vince. It is kind of plonked there but the point that could be made is either not there or it is at the very least not wholly rounded out. The performances are pretty solid overall. As one of the two leads, I thought Ethan Embry who played Vince was the pick of them, seeming to channel Tom Hardy a little and he nicely mixes up a sense of fun with a definite dash of intensity. His comedic sense is great and it would be cool to see this film lead to more opportunities for him. 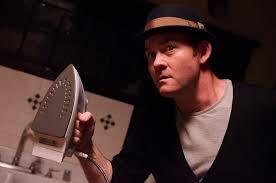 Koechner is probably the most famous person on the cast. Initially he is just so ‘big’ with the performance it’s distracting. You can’t help seeing him a little as Champ Kind, with his uber obnoxious loudmouth air. As the film goes on though, this tempers a little and he actually establishes pretty easily a character that stands well apart from Champ, so it is good to see that he has the ability to pull that off. 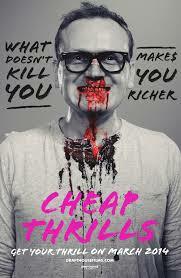 Cheap Thrills is an interesting film with a great core concept. It definitely could have taken that concept, and the commentary on us as individuals and a society further, but at the very least those ideas are there. At its best, this is really, really good. As it stands though, its just good, but the kind of good that is different enough from the norm it is probably worth your while checking out. Related beermovie.net articles for you to check out: The Tunnel and Devil. Hmm interesting question. I think it is effective in what it sets out to do. But the aim of that is not really to frighten in the same way you would say of most horror films. I sort of feel it is categorised as a horror film more cause of the level of gore than anything else. Would be interested to hear your thoughts on that after you have seen it. Cool. Yeah, from what little I have read about it I don’t think I’ve considered it horror so far but it definitely appears to have elements in there, and like you said, elements that aren’t traditional “jump-scare” type horror. I look forward to accessing this when I can. Solid review. This sounds interesting. Cheers Fernando. It is a great concept. Worth taking a look at.